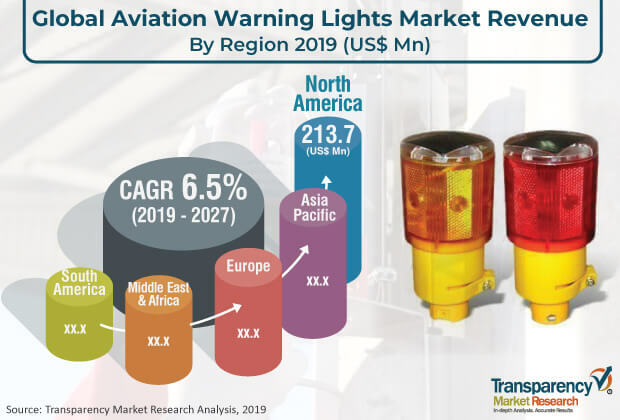 The global aviation warning lights market was valued at US$ 721.4 Mn in 2018 and is anticipated to register a stable CAGR of 6.5% from 2019 to 2027, according to a new research report, published by Transparency Market Research (TMR) titled ‘Aviation Warning Lights Market – Global Industry Analysis, Size, Share, Growth, Trends, and Forecast, 2019–2027.’ Increasing demand for high-rise skyscrapers and government regulations and policies to increase adoption of obstruction lights for aircraft safety are driving the global aviation warning lights market. The market in North America is expanding at a significant CAGR of 6.6%, owing to numerous technological innovations and development of smart cities in the region. Economic growth, high living standards, and rapid development of smart cities are resulting in increased demand for tall buildings across the world. In order to meet this rising demand and attract buyers, players in the construction sector are building high-rise apartments, thereby differentiating their projects from others. Significant developments in the telecommunication industry and wind turbines and rising demand for high-rise skyscrapers are some of the primary factors driving the global aviation warning lights market. High costs of raw materials, such as LEDs, are some of the factors hindering the market. Several companies are making efforts to carry out research and development activities to introduce innovations in aviation warning lights. In order to prevent risk of collision in case of aircraft flying near the structures, the demand for aviation warning lights is rapidly increasing. Aviation warning lights make structures more visible for passing aircraft. They are usually used at night, although they can be used during the daytime. These lights need to have sufficient brightness in order to be visible at miles away from the structure. Moreover, high-rise buildings offer technological as well as financial advantages in areas with high population density. They have become a distinctive feature of housing accommodation in virtually all densely populated urban areas worldwide. Hence, the rising demand for high-rise skyscrapers is expected to augment the utilization of aviation warning lights across the world during the forecast period. Stringent mandatory regulations set for installation safety of aircrafts as well as tall residential and commercial buildings are expected to drive the global aviation warning lights market during the forecast period. Installation of aviation warning lights is the most common and widespread regulation mandated by various governing bodies such as International Civil Aviation Organization (ICAO) and Federal Aviation Administration (FAA). These government/regulatory authorities have mandated the installation of aviation warning lights on tall structures so that they can be visible during the daytime as well as at night. These devices come in different shapes, colors, beam patterns, and light intensity. They offer an acceptable level of safety defined by international regulations and national standards. These factors are boosting the global aviation warning lights market. Geographically, the global aviation warning lights market has been divided into five major regions. These include North America, Europe, Asia Pacific, South America, and Middle East & Africa. In 2018, North America was the leading region of the global market, followed by Asia Pacific. This can be primarily attributed to presence of a large number of tall structures and growing incidence of aircraft collisions in North America. Regulations and policies associated with aviation warning lights and early adoption of the LED technology are some of the other factors driving the market in the region. The U.S. held the maximum share of the market in North America in 2018. The market in the country is estimated to expand at a considerable CAGR during the forecast period. The market in Europe is anticipated to expand at a significant CAGR during the forecast period, owing to development of aviation infrastructure and rising investments in the region. The aviation warning lights market in Asia Pacific is expected to expand at the maximum CAGR of 7.2% during the forecast period. Factors such as growing technological advancements and development of high-rise buildings in developing countries such as China are expected to drive the market in Asia Pacific during the forecast period. Furthermore, growing construction activities in countries of Asia Pacific have led to increase in the penetration of aviation warning lights in the region. The market in Middle East & Africa and South America is expected to expand at a substantial pace from 2019 to 2027, due to growing number of towers and tall buildings in these regions. The company profiling of key players operating in the global aviation warning lights market includes company overview, major business strategies adopted, SWOT analysis, and market revenues for years from 2016 to 2018. Key players operating in the global aviation warning lights market and profiled in the report are Astronics Corporation, Avlite Systems, Cooper Industries Inc. (Eaton Corporation plc), Delta Obstruction Lighting Ltd, DeWiTec GmbH, Flash Technology, LLC. (SPX Corporation), Wetra Aviation Obstruction Lights, Drake Lighting, Inc., Dialight plc, Contarnex Europe Limited, Avaids Technovators Pvt. Limited, Hughey and Phillips, LLC., Orga BV, Q-AVIATION, Farlight, and Sirena SpA. Various players are introducing technologically advanced aviation warning lights and establishing partnerships with other players.